1991: Discouraged from invading real countries, the Axis powers reunite to invade fantasy characters’ digestive tracts. Let’s talk gun control. I don’t like living in a world full of guns and bombs and drones. I never had. Ever since…fourth grade, why not?…I’ve dreamed up method after method that humanity could adopt in order to rid the planet of high tech weaponry. And then replace them with swords, spears, and bows. As a kid, swords fascinated me. No one ever considered me angry, or aggressive, and I don’t think I ever once played soldier. I didn’t even play pretend in the Middle Ages. I just liked the idea of a fantasy world with magic and dragons and heroes. Heroes, of course, who always wielded a legendary sword, enchanted by some wizard or possessed by the spirits of nature. I lusted for fantasy combat, adventures, traveling long distances and sleeping on the ground. I had a hero’s soul. I needed to live a hero’s life! Of course, two decades later I realize that yearning for a medieval lifestyle requires a fondness for poverty, war, plague, dysentery, and a government that hands out tortures and executions like speeding tickets, and I now consider myself a hero if I can leave a comment on Facebook without igniting a flame war. And their grammar grades lost by 20. Hopefully they won’t receive too many damages. But, of course, any excuse to pick up a sword and fight evil would do for childhood Jake, and I suspect that early video game RPGs owe their success to that phenomenon. In retrospect, Final Fantasy and Dragon Quest play as well as children suffering from polio and severe brain trauma, but with no other kids in town they must have seemed agile and imaginative by lack of comparison. But take the aforementioned kid, then add a raging hemophilia and an angry pet hedgehog, and you’ve got the perfect metaphor for Final Fantasy Legend II, a sluggish, bland, poorly translated, glitch-ridden little weevil for the game boy that somehow has garnered high reviews in the 20+ years since it came to the U.S. Uh, as per California state law, I’ll require positive verbal consent before this level. 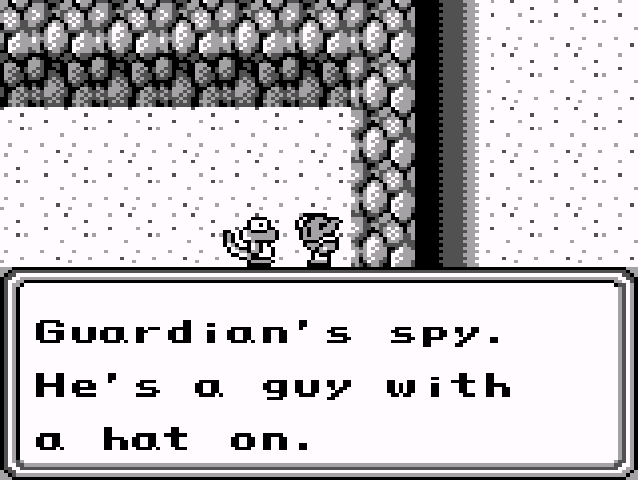 Final Fantasy Legend II doesn’t really have characters. 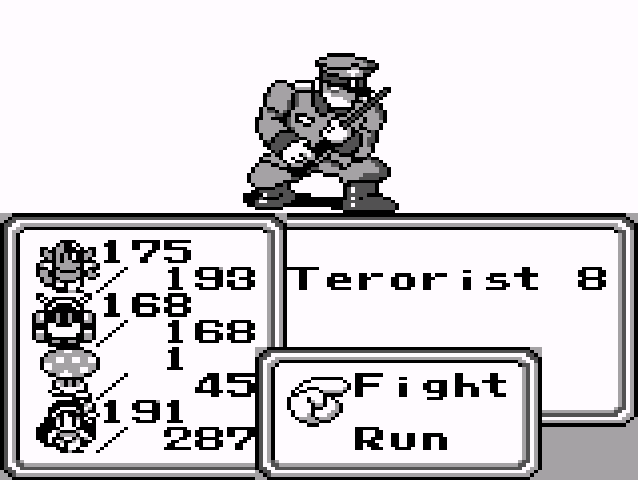 They have text to tell you what to do next, but they really emphasize combat above all else. I would complain that the extremely high rate of random encounters sends me into battle on a single step away from my previous battle, but two or three times I finished fighting monsters, then without moving I hit the menu button, only to immediately get sucked into another battle. Again, as fits the style of the time, characters fall drastically short of effective combat stats, and the groups of monsters often more than 10 at a time regularly pose a risk of slaughtering your party. Upon death, Odin will appear and offer you the opportunity to repeat the fatal battle as often as necessary, but except for once or twice, but often the cause of my demise hinged on the size of the enemy hoard preventing any chance of victory, so I’d take up Odin on his offer only to run from the monsters when I could. …can I politely decline to receive the Rhino’s meat? That sounds painful. As if wading through a world filled elbow-deep with enemies like a claw crane machine didn’t slow down the pacing enough, characters don’t earn experience or level up in a traditional sense. 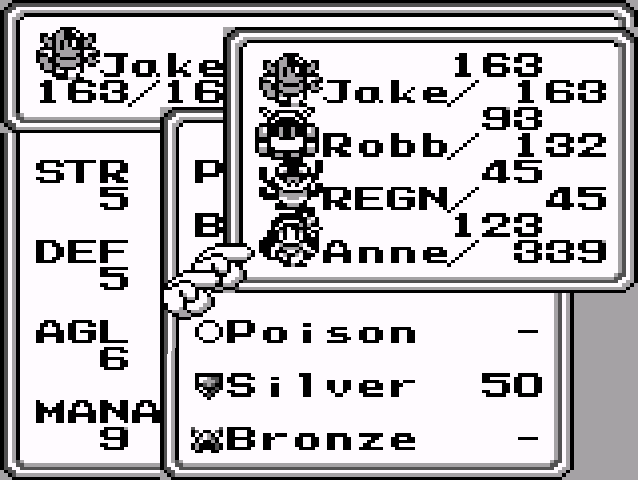 The best I can determine, the game awards stat bonuses based on actions in battle, like in Final Fantasy II (NES). However, you select your party from a list of humans, mutants, robots and monsters, and only the humans and mutants seem to get these stat bonuses. The robots improve states based on equipment–as one might expect a robot to do–and the monsters transform into other monsters by devouring the corpses of your fallen foes. So after hours of grinding, I had a human who could deal formidable damage at a reasonable speed, a mutant who could sometimes pick off a few enemies if he lasted long enough, and a robot and a monster who only contributed to the battle by presenting themselves as targets. 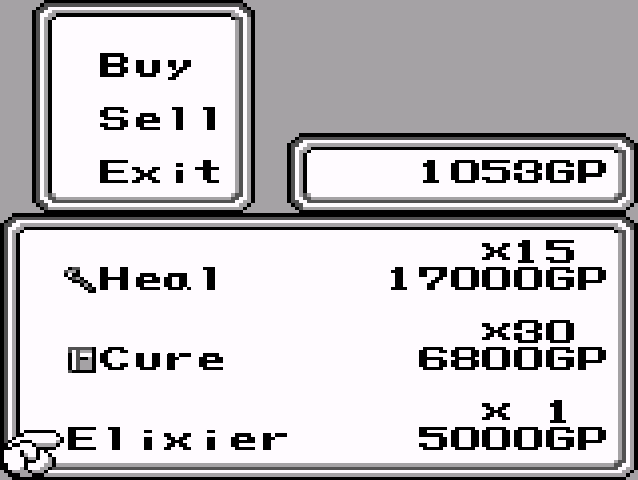 Each item even more elixier than the last! If you ever suspected yourself of having a trace of OCD, avoid this game for its menus. Characters can equip a set number of weapons, magic or items, but as many as they want of each. Except for armor. And certain spells which seem character specific. And a few abilities that don’t seem to do anything. Oh, and the monster can’t equip anything, which limits how much your party can carry. Once again as usual for this era of RPGs, the game treats healing items and spells like novelty trinkets, dropping them here and there when it thinks you might have some cash to spare, and kindly exiting the menu after a single use. How much did you heal, 30 HP? That should easily get you through the next dozen battles with 15 monsters apiece, each holding fully automatic rifles and a belt made from the thumbs of previously defeated players. But apparently Square felt they needed to make the game just a little harder, so the equipment degrades with each use. Now, I’ve seen equipment degradation done right. Well, maybe “well enough,” would more accurately describe it. I mostly worked in Fallout, although I did get tired of lugging around a half dozen suits of power armor as spare parts. Here, I can understand how combat might reduce the strength of a sword over time. I can even picture a shield, dented beyond use. However, when merely raising the shield in front of you reduces its life span, I have to wonder whether a material that degrades in a slight breeze would effectively block so much as an angry butterfly, let alone any potential enemy attacks. After days of grinding, I finally have the stats to…what the hell? Five? For all its faults, I would have slogged through this all the way. I did finish all the main-series Final Fantasy games, as well as both Dragon Quest games I’ve played. And I could see how a hand-held level grinder might have some value on a long car trip with a family you’d much rather ignore. However, the game has glitches. Fatal glitches. For instance, if a character runs out of viable options for use in battle, the other characters, apparently not wanting him to feel bad, will stop doing damage to enemies with their own attacks. I did pick up two items marked “power,” but can’t tell you what they do since using them freezes the game upon exiting the menu. However, most fun of all the glitches, somehow I triggered one that resets the game as you attempt to open a passage leading to the next area of the story. I’ve respectfully gone through games that I didn’t want to play after a little while, but I’ve never played a game so rude that it didn’t want me to play it. Maybe now I can find the FF game boy game that spawned the Seiken Densetsu (Secret of Mana) series. This entry was posted in Final Fantasy, Game Boy, SaGa and tagged final fantasy, game boy, SaGa. Bookmark the permalink.